Fire blindness: failure to recognize the prominent ecological and evolutionary role of fire in fire-prone ecosystems (Pausas & Lamont 2018). Figure 1: The evolutionary pressures that shape the phenotype and genotype of an organism can be aggregated into three dimensions (A): environmental factors (e.g., climate, soils, topography), disturbances, and biotic interactions; each of these dimensions is related to a particular set of traits. 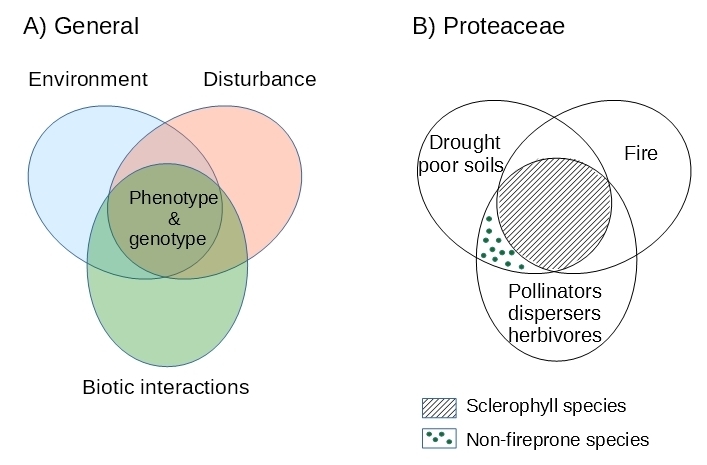 In the case of the Australian Proteaceae (B), the factors determining these three dimensions define the characteristics of most species (sclerophyllous species; patterned area); excluding one dimension (fire) define the few Proteaceae species that occur in non-fireprone ecosystems (dots, and figure 2 left). From . Figure 2: Proteaceae species richness in Australia by cells of 1 degree. Left: genera in non-fire-prone vegetation (rainforest and vine forest). Right: genera in fire-prone vegetation (sclerophyll shrubland, woodland and forest, and savanna grassland). Proteaceae without fire would be confined to the rainforest fringes and depauperate in species instead of the dominant position it currently occupies throughout the Australian continent. From . ¡IMPORTANTE! Responde a la pregunta: ¿Cuál es el valor de 9 12 ?